Are you hoping to redesign your child's bathroom? If so, make the room both spunky and functional for even the smallest lavatory users. Rather than using the delicate grays and blues of your bathroom, boost the color of your child's space. Shelterness, a home-design website, discusses the importance of making the room bright and colorful. Vibrant primary colors can instill a positive mood in the room. Cover any white walls with one or two vibrant colors, like orange, green or pink. You can paint these surfaces solidly, or have a little fun with striped or polka-dotted walls. If there's an artist in you, why not make a mural? Your children will likely adore an underwater or jungle scene in their bathroom. When choosing the essentials for the bathroom, from the toilet to the vanity, think of your child's capability. Decoist, an interior design source, reminds you to design the room so children can easily navigate it without your help. Do this by keeping everything uncomplicated and in reach. First, choose a bathroom vanity that kids can access easily. If more than one child uses the bathroom every day, invest in a double sink vanity. This way, your kids can easily share the facilities in the morning. Make sure the vanity has plenty of storage space. Again, if several children use the bathroom, provide enough room for all of them to stow their towels and toothbrushes. Find a vanity with plenty of drawers and shelves. Also, you might keep a couple of stools nearby so that your kids can step up to see the mirror. Try to find wooden pieces. This way, you can easily paint the vanity, linen cabinet and any wall shelving. Stick a few fun decals on the mirror and walls, and find a funky shower curtain and bath mat. You might love a steam shower, but keep it simple for the kids. 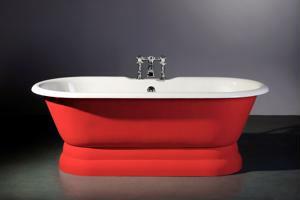 A claw foot tub will add a fun and classic aesthetic to the bathroom. You can easily install a shower arm and head to one of these fixtures so children can either soak in the tub or take a shower. Remember to avoid being neutral in your design choices. Kids don't need soft lighting and subtle, soothing colors to enjoy their bathroom. Make it a fun place for them to get ready in the morning with vibrant colors and offbeat decor.